Astronaut Schmitt stands next to a huge, split boulder. In this historical photo from the U.S. space agency, Geologist-Astronaut Harrison H. Schmitt is photographed standing next to a huge, split boulder at Station 6 on the sloping base of North Massif during the third Apollo 17 extravehicular activity (EVA-3) at the Taurus-Littrow landing site. 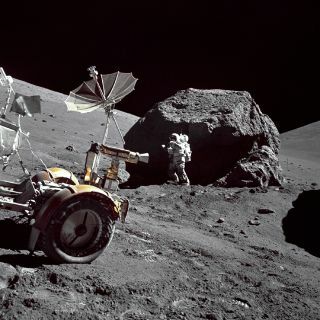 The "Rover" Lunar Roving Vehicle (LRV) is in the left foreground. Schmitt is the Apollo 17 Lunar Module pilot. This picture was taken by Commander Eugene A. Cernan.